On Wednesday I started my sauerkraut for our New Year’s Day tradition. We’ve been eating sauerkraut for New Year’s in my family since I can remember. We used to go out to my grandma’s house and she would have a big roaster full of sauerkraut, sausage and dumplings. When my grandma died my dad took over. He developed his own special recipe, changing it each year to make it better. It’s not your typical kraut recipe, it includes carrots, apples, tomatoes and all kinds of delicious goodness. For a few photos of my dad cooking on New Year’s and the recipe see this post. 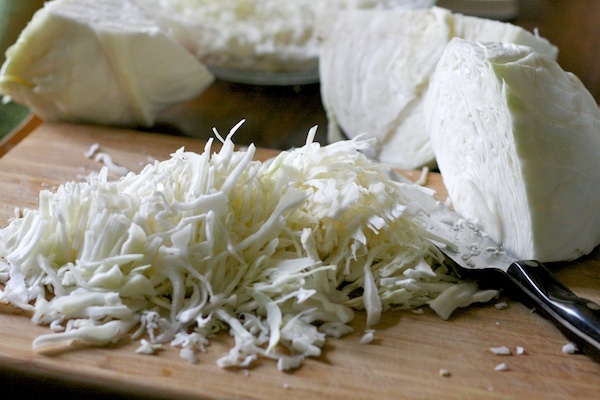 Sauerkraut that ferments at cooler temperatures – 65 or lower – has the best flavor, color and vitamin C content. The fermentation process takes longer at these temperatures, around 4-6 weeks. That’s probably why it’s traditionally made in the fall. Looks like I’m making mine at the right time, it should be ready by mid-December and waiting in the fridge for New Years! Making sauerkraut is quite easy all you need is cabbage (red or green), salt, and time (generally 3T of salt for every 5 lbs of cabbage). First you slice up the cabbage as thinly as you’d like, I usually do some really thin and some thick for variety. Then you put some sliced cabbage in a bowl and sprinkle salt over it, then smash with a wooden spoon or potato masher and mix. 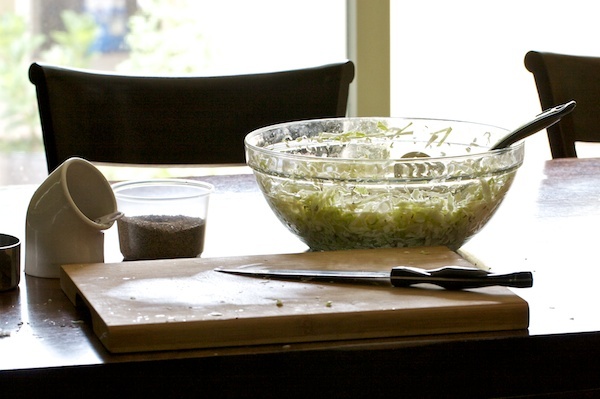 Continue adding cabbage and salt and mixing and smashing until the bowl is half full. When I was making this I thought about all the women in past generations of my family that spent time each fall making sauerkraut for New Year’s. Connecting with our food heritage is such a wonderful thing. Hopefully our nieces & nephew will grow up with fond memories of eating Grandpa’s Famous Sauerkraut on New Year’s and continue the tradition with their families. Do you have a specific food or menu that has been passed down through the generations of your family? I grew up with Italian traditions which root back to my maternal grandmother whose family came southern Italy. I remember my mom getting a bushel of long skinny peppers every fall and then stringing them up and hanging them in various places around the house to dry. (I eventually saw this done in Italy when I spent a semester abroad there and was so excited!) Then, on Christmas Eve, she took out the dried peppers and flash fried them in oil. That oil would take on the pepper flavor and would top bacala (salt cod) and be served with capellini with marinara sauce. There’s nothing like it in the world! It’s a family treasure. We, too, just finished making a batch of kraut. What a great tradition your family has, I may have to try a version of your dad’s recipe out it sounds very good. .-= Mike´s last blog ..One Thing Leads to Another… =-. As a French living in Bavaria, your advices are very useful to me. I will try to make sauerkraut and let my German friends test it! I thought that you had to keep the air out of the crock or it would go bad… does the layer of brine on top do that or are you covering the whole jar with something? The brine covers the cabbage, you don’t want the cabbage touching the air and the brine keeps that from happening. If scum forms on top of the brine you just skim it off. You do have to periodically check the jar to make sure the cabbage is still covered in brine. I made my first batch of sauerkraut this summer, following the Juniper Berry Kraut recipe from Joy of Pickling and it turned out well. I covered the top of my kraut with an extra cabbage leaf or two, then a plastic bag filled with saline solution. Seemed to be ok.
Once my first batch was done, I put it in the fridge, and when I want sauerkraut for something, I just help myself. Do you know how long it will last in the fridge? Should I have canned the extra? .-= Gudrun´s last blog ..Butternut Squash and Apple Soup (recipe) =-. I think it will last for quite a while in the fridge (probably until it tastes “off”). I’m sure in the old days they just kept it in the crock in a cool area of the house. If you want to eat it for probiotic reasons I wouldn’t can it, it kills all the good stuff in there. I usually cook mine, so this summer I canned some. We have a few things that have been passed down, and a few things I plan on passing down. My great-grandmother used to make marshmallows (no corn syrup required) and I revived the tradition several years ago. .-= melissa´s last blog ..it’s the meat of kings =-. The jar is a one gallon barrel jar from Anchor Hocking. I’ve considered getting the 2.5 gallon version (link below) for pickles. I really like the wide mouths, it makes them easy to clean!!! I keep wanting to make marshmallows, I found a recipe with egg whites and I can’t wait. I think that will be a winter treat when I’m a little less busy! Our family has carried on a couple of traditions. One is a chili recipe from my Great-Great Aunt. She lived on her own until she was around 100 and passed away around 104. We used to chuckle at the fact that the recipe called for suet – now it endears the recipe to me even more. The other dish is one we’ve always just called Lettuce, but based upon a few recipes I’ve seen out there it’s also likely called “Dutch Lettuce” or “Wilted Lettuce.” My family is the only one that really likes it so my Grandma looks forward to getting together with us at least once a year for it. We’re having it on Tuesday and I can’t wait! .-= Pampered Mom´s last blog ..Folk Music Fridays – "Pick a Bale of Cotton" =-. MMM, I’d put suet in my chili! I’ve been looking for a local source of tallow and suet. That’s great that you guys still have the favorite recipe with grandma! 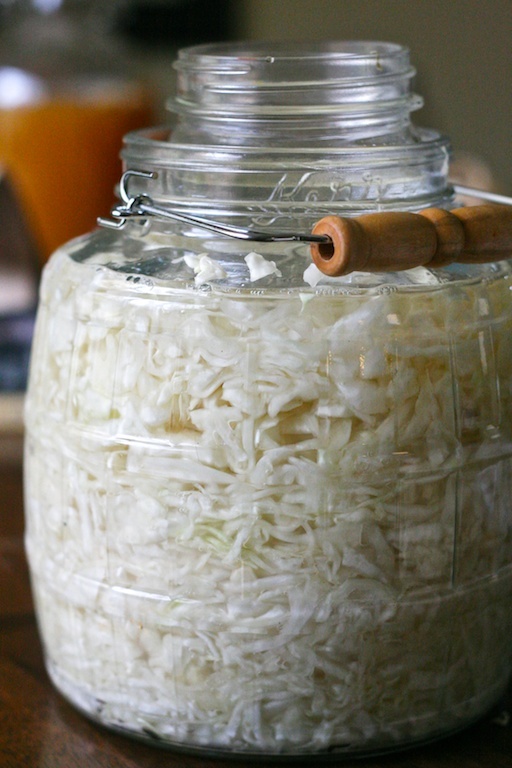 Questions – Where do you let the sauerkraut sit while it’s doing it’s thing for 4-6 weeks? I’m asking because I’d like to try, but live in Florida, so need to determine it the 4-6 weeks will need to be in the fridge, because we can be very warm in the summer – even here in NW Florida. Some people put it in a dark cabinet, I usually just leave it on my kitchen counter or on the dining room table so I remember to check on it periodically. 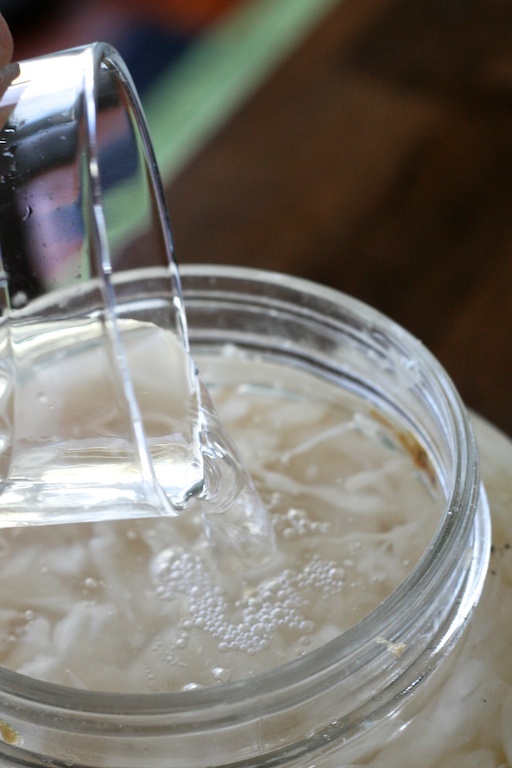 You can make it at higher temps (my mom used to make it when they lives in the jungles of South America and it was in the 100’s) it just ferments faster. One of my maternal great grandfathers spent time stationed in India with the British army. Ever since, our family has made curry for any informal get-together. I’ll admit, ours might not be genuine Indian fare, as over the years it has evolved to incorporate other pan-Asian cuisines. But it’s a great recipe that can be adapted to almost any type of ingredient. One of my favourite versions if I think there might be vegetarians for dinner, for instance, uses sweet potatoes, apricots and chick peas. .-= Helen at Toronto Gardens´s last blog ..What’s to love about a rainy October day? =-. That is one of the nice things about canning/preserving/fermenting. It’s all about the future and it definitely is a hopeful endeavor! I usually was the jar really well with hot soapy water beforehand. The ratio of salt to cabbage is generally around 3 Tablespoons of salt (I use sea salt) to 5 lbs of cabbage (you do want to avoid iodized salt). Some people will probably tell you to not used sea salt, but I’m sure that’s what people have been using for years before store-bought salt was available and I only keep sea salt in the house. how lovely to have a tradition of making and eating a dish together each year. We don’t have anything like that only the national tradition of eating turkey on christmas day which we kick back against because I’m veggie and my husband prefers other meat to turkey. That’s a great idea for a wedding present. You’re so lucky you had the recipe or it would have been lost forever. I make mine the same and you’re right, it can’t get any easier! Is that a Kerr jar? I am in total envy! Great find! .-= Diane´s last blog ..Happy Happy Day! =-. It’s Anchor Hocking (1 gallon). I like it because I can fit a batch of sauerkraut made with 2 large heads of cabbage or 3 small ones in each jar. I was going to ask about the jar, too, so I’m glad I read some of the comments. I added a few rows to my garden plan next spring so that I’ll hopefully have plenty of cabbage to ferment next year. Any dumpling recipe will do, my dad always uses the generic one from the Betty Crocker cookbook.